SALT LAKE CITY (April 23, 2015)–Organizers of the 2015 Larry H. Miller Tour of Utah today published maps and route details on its website for all seven days of the men’s professional cycling stage race on Aug. 3-9. A field of 16 of the best men’s cycling teams in the world will compete over 712 miles and 51,442 feet of elevation gain, solidifying “America’s Toughest Stage Race”as the most challenging 2.HC race in North America, sanctioned by the Union Cycliste Internationale (UCI). Start times for the first five stages have been modified to accommodate live national television broadcasts on FOX Sports Network (FSN). Stage 1 to Stage 4 will be covered live from 1-3 p.m. MT. The majority of Stage 5 will be featured in a 5-7 p.m. MT time slot for live coverage. FSN will broadcast the final two hours of Stage 6 and Stage 7 in the traditional 2-4 p.m. MT time slot across the U.S. FSN will also broadcast evening highlight shows, and TourTracker will provide start-to-finish live race coverage via web cast and mobile applications all week. Courses and start times for the Tour of Utah Women’s Edition: Criterium Classic have also been announced. On Monday, Aug. 3, the Criterium Classic will take place from 11 a.m.-12:15 p.m. on a 1.5-mile circuit in downtown Logan. On Tuesday, Aug. 4, the second day of racing will take place from 11:30 a.m.-12:45 p.m. on a 1.45-mile circuit in downtown Ogden. The Larry H. Miller Tour of Utah gained international status in 2011 when it was sanctioned by the UCI, the global governing body of the sport of cycling. In 2015 the race has been elevated to a 2.HC rating, one of only three such multi-day events in North America. This year’s Tour of Utah will continue as the first internationally-sanctioned cycling competition in North America for men following the Tour de France. Stage 1 is the longest opening day in Tour of Utah history at 132 miles. The route will take riders from downtown Logan through Logan Canyon and Garden City, then navigate 48 miles around Bear Lake, known as the “Caribbean of the Rockies”for its turquoise-colored water. The race will roll through Idaho for the first time around the north side of Bear Lake. Returning through Garden City and Logan Canyon, racers will also pass the Beaver Mountain Ski Area a second time on the stage. There will be two circuits in downtown Logan, with the finish along North 100 East and Federal Avenue. Spectators in downtown Logan will be treated to the Women’s Edition: Criterium Classic the same day, which uses the same start/finish area as the men. Stage 2 presented by Workers Compensation Fund will see the Tour start for the first time in Tremonton. Racers will enjoy the wide, rural roads of Box Elder County, including the famous Fruit Highway (Hwy 89). 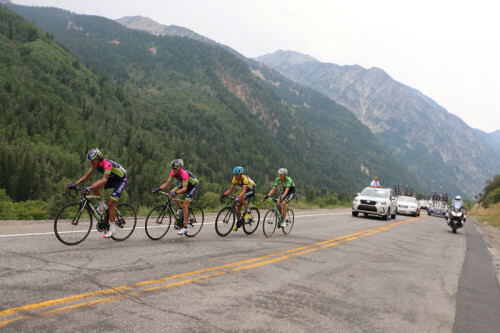 Rolling along the Wasatch Front through Honeyville, Brigham City, Perry and Willard, the race will then enter Weber County and the city of Ogden. The route heads west through Ogden Canyon and around Pineview Reservoir before returning to Ogden via the North Ogden Divide. Once the race re-enters downtown, spectators will be treated to three laps of a 2.28-mile circuit that will finish on Historic 25th Street across from Ogden Municipal Gardens. It is the first time the Tour of Utah has returned to Ogden for a stage finish since 2012. A similar downtown circuit will be used for the Women’s Edition: Criterium Classic. Stage 3 presented by Zions Bank visits Davis County for the first time, including a start at Antelope Island State Park. The largest island in the Great Salt Lake, riders will enjoy four miles on the island and cross the seven-mile causeway to the mainland, leaving behind a large wildlife population of antelope, bighorn sheep and more than 600 free-roaming American bison. Racers will encounter familiar roads up the North Ogden Divide and the Eden Valley from the day before, but this time in a clockwise direction. After racing around Pineview Reservoir, the race will head up Trapper’s Loop in the shadow of Snowbasin Resort, a previous venue for the Tour of Utah (2013) and Olympic Winter Games (2002). The race will re-enter Davis County and have two nine-mile circuits in Bountiful, which include a difficult climb on 400 North along the Bountiful Bench. The first-time finish in downtown Bountiful will be on Main Street at Center Street, with the peloton rolling in a northbound direction. Stage 4 presented by Subaru has a new start/finish at Soldier Hollow in the Heber Valley, site of the 2002 Olympic Winter Games biathlon and Nordic events. The race will head up Daniels Canyon past Strawberry Reservoir and along the undulating terrain in Duchesne County for the first time. Heading through the Uinta National Forest, racers will make an inaugural climb up Wolf Creek Pass this year, descending into Woodland on the way through Midway to Soldier Hollow, which sits in Wasatch Mountain State Park. A long, uphill finish line at Soldier Hollow will give spectators a great location for the exciting finish across from the Day Lodge at Soldier Hollow. Stage 5 presented by Utah Sports Commission revives the popular Salt Lake City circuit, which returns from 2013 with a twist. Starting on the north side of the Utah State Capital on 500 North, the race will follow the traditional route, passing City Creek Canyon, the Avenues neighborhood and the University of Utah. The race will descend down South Temple and turn right on the steep climb up State Street, then make a new turn on North Temple to 200 West, passing through the Marmalade and Capitol Hill neighborhoods. Things get interesting as the race turns right on 600 North and ascends 20 percent grades up Wall Street and Zane Avenue to the hilltop finish at the Utah Capitol. The race will complete seven laps to make this the hardest 55 miles of the week. Huge crowds are expected to congregate at Reservoir Park, which will host the Lifestyle Expo and will see the race pass on three sides of the park. Stage 6 presented by University of Utah Health Care continues as the “Queen Stage,” with 12,959 feet of climbing from Salt Lake City to Snowbird Ski and Summer Resort. The 110-mile journey begins at a new start location in front of the historic Rio Grande Depot in downtown Salt Lake City. Riders will roll out passing Pioneer Park, which hosts the Downtown Farmers Market each Saturday from June to October, and take 800 North to Emigration Canyon. The race continues through Morgan and Summit counties on the way to Park City and the brutal climb to Guardsman Pass, followed by the fast descent of Big Cottonwood Canyon to Wasatch Boulevard. For a ninth year, and the second consecutive year starting in Salt Lake City, the Queen Stage will finish with the legendary six-mile climb of Little Cottonwood Canyon to the Snowbird Ski and Summer Resort. This same route will be used earlier in the day for The Ultimate Challenge, an amateur cycling event hosted by the Tour of Utah, University of Utah Health Care and Harmons Grocery. Stage 7 presented by VLCM/ Barracuda uses the same course that has been used since 2013. The 78-mile race will once again start and finish on Historic Main Street in Park City and include one of the toughest climbs in the world at Empire Pass. This six-mile climb has a gradient that averages 10 percent, with pitches greater than 20 percent. Last year, the race saw former world champion and Tour de France champion Cadel Evans (Australia) of BMC Racing Team use his superior descending skills to catch and pass the lead group on the Mine Road, with speeds exceeding 60 miles per hour, to take his second stage win of the week in Park City. American Tom Danielson of Cannondale-Garmin took the overall title for a second consecutive year on Stage 7. Logan will host the first day for the Omnium event, with an 11 a.m. start. Top women’s professional and elite cycling teams will race for 75 minutes on a technical 1.5-mile course with six corners in downtown Logan, a similar loop that will be used by the men for the Stage 1 finish. Starting on 100 East and Federal Avenue, the course will turn left on Center Street and start a long, gradual climb through Boulevard to 400 East. The course levels out before the riders turn left on 300 North and encounter a fast downhill to the last corner to the finish line. Ogden will host the second and final day for the women, racing 75 minutes from 11:30 a.m. to 12:45 p.m. The start/finish will be located on Historic 25th Street and Kiesel Avenue, across from the Ogden Municipal Gardens. This fast, flat 1.5 mile circuit has six corners, using some of the same roads the men will race for the Stage 2 finish. The course turns right on Washington Avenue to 28th Street, followed by a right turn on Grant Avenue, a left turn on 26th Street, a right turn on Lincoln Avenue, then a final right turn on Historic 25th to the finish. The winner of the Criterium Classic will be determined by total points from the two days of racing. To date, 13 men’s professional teams have been confirmed as part of the final field of 16 teams. Four of those teams have also received invitations to race at the Tour de France. A two-day USA Cycling-sanctioned competition (NCC) will be held this year for top women’s professional and domestic elite cycling teams on Aug. 3-4. Eleven women’s teams have been confirmed for the Tour of Utah Women’s Edition: Criterium Classic. For more information visit www.tourofutah.com.